Bay of Fundy, New Brunswick, Canada. Colin Bates (colinba@interchange.ubc.ca). © Coastal Imageworks (colinba@interchange.ubc.ca). Published in: Wynne, M.J. & Heine, J.N. (1992). 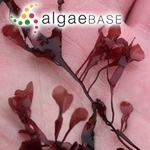 Collections of marine red algae from St. Matthew and St. Lawrence Islands, the Bering Sea. Nova Hedwigia 55: 55-97. The type species (holotype) of the genus Coccotylus is Coccotylus brodiei (Turner) Kützing. Type locality: "Eismeer", Eastern Siberia (Silva 1996-to date). Lectotype: LE (Le Gall & Saunders 2010: 382). Notes: Dixon & Irvine (1977: 227) cite "lectotype: LE" Arctic Seas but do not indicate who it was designated the lectotype. Le Gall & Saunders (2010: 382) designate as lectotype, a specimen labeled "truncatus" in what must be Pallas's hand (shown in a copy of photographs of Pallas's collection). Le Gall & Saunders (2010: 382) write "Although Newroth (1970, p. 30; see also Newroth and Taylor 1971) did not view the type collection at the time he wrote his PhD dissertation, he relays correspondence with Zinova in which a specimen with Pallas’s handwriting is discussed and presumably provides the basis for figure 1 in her own work (Zinova 1970, the figure caption in Russian indicating essentially ‘‘Typical form’’) in which the new combination Phyllophora truncata (Pall.) Zinova is presented. Subsequently, Newroth received two photographs of Pallas’s collection and kindly provided us with a copy, which shows a specimen labeled ‘‘truncatus’’ in what must be Pallas’s hand that we designate as the lectotype of C. truncatus." Adjective (Latin), truncate, i.e., ending very abruptly as if cut straing across (Stearn 1973). Guiry (1997) suggests consulting Wynne & Heine (1992) regarding the synonymy between Phyllophora truncata and Coccotylus truncata. Swedish: Kilrödblad (Tolstoy & Österlund 2003). Europe: Faroe Islands (Irvine 1982), Ireland (Adams 1907, Adams 1908, Cotton 1912), Sweden (Kylin 1907). Atlantic Islands: E. Greenland (Lund 1959). Arctic: Alaska (Arctic) (Mathieson & Hehre 1986), Canada (Arctic) (Lee 1980), Svalbard (Spitsbergen) (Gulliksen et al. 1999). Europe: Faroe Islands (Irvine 1982), France (Dizerbo & Herpe 2007 ), Germany (Ludwig & Schnittler 1996), Ireland (Guiry 1978, Whelan & Cullinane 1985), Romania (Caraus 2002, Caraus 2012), Spitsbergen (Vinogradova 1995). Atlantic Islands: E. Greenland (Pedersen 1976), Iceland (Caram & Jónsson 1972). North America: Alaska (AK) (Lindstrom 1977, Scagel et al. 1989), Connecticut (CT) (Schneider, Suyemoto & Yarish 1979), New Hampshire (HN) (Mathieson & Hehre 1986). Arctic: Barents Sea (Malavenda 2018, Malavenda 2018), Svalbard (Spitsbergen) (Gulliksen et al. 1999, Hop et al. 2012 , Fredriksen et al. 2014), White Sea (Smirnova & Mikhailova 2013, Garbary & Tarakhovskaya 2013, Mikhaylova 2017). Europe: Atlantic France (Burel, Le Duff & Ar Gall 2019), Baltic Sea (Nielsen et al. 1995, Kontula & Fürhapter 2012), Black Sea (Milchakova 2011), Britain (Hardy & Guiry 2003, Bunker et al. 2017), Bulgaria (Temniskova, Stoyneva & Kirjakov 2008), Denmark (Larsen & Sand-Jensen 2006, Lundsteen & Nielsen 2015), Faroe Islands (Nielsen & Gunnarsson 2001), France (Anon. 2017), Helgoland (Bartsch & Kuhlenkamp 2000), Ireland (Morton 1994, Guiry 2012, Bunker et al. 2017), Norway (Rueness 1997, Brattegard & Holte 2001, Husa, Steem & Sjøtun 2014), Romania (Caraus 2012, Caraus 2017), Scandinavia (Athanasiadis 1996), Spain (Conde et al. 1996, Cires Rodriguez & Cuesta Moliner 2010), Spain (incl. Canary Is.) (Gallardo et al. 2016), Sweden (Tolstoy & Österlund 2003), Turkey (Europe) (Taskin et al. 2008 ). Atlantic Islands: Azores (Neto 1994), Greenland (Pedersen 2011). North America: Alaska (AK) (Wynne & Heine 1992), Baffin Island (Küpper et al. 2016), Maine (ME) (Mathieson et al. 2001), Manitoba (Saunders & McDevit 2013), New Brunswick (Bates et al. 2005), Prince Edward Island (Le Gall & Saunders 2010). South-west Asia: Turkey (Asia) (Taskin et al. 2008 ). Asia: Russia (Far East) (Perestenko 1994, Selivanova 2002). Le Gall, L. & Saunders, G.W. (2010). DNA barcoding is a powerful tool to uncover algal diversity: a case study of the Phyllophoraceae (Gigartinales, Rhodophyta) in the Canadian flora. Journal of Phycology 46(2): 374-389. Lundsteen, S. & Nielsen, R. (2015). 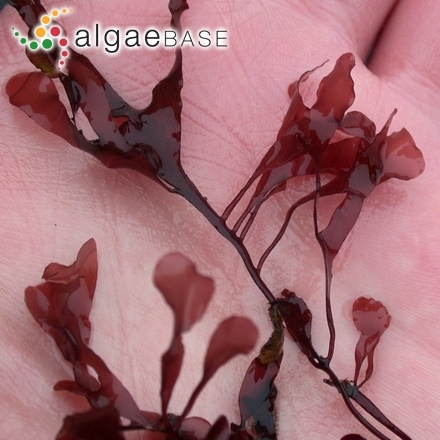 Coccotylus brodiei, C. truncatus and other Phyllophoraceae (Rhodophyta) in Danish waters. Forum om Marin Bundfauna og –Flora 2: 1-20. Pedersen, P.M. (2011). Grønlands havalger. pp. 7-208. Copenhagen: Forlaget Epsilon.DK. Accesses: This record has been accessed by users 5547 times since it was created. Martin, G., Paalme, T. & Kukk, H. (1996). Long-term dynamics of the commercially usable Furcellaria lumbricalis-Coccotylus truncatus community in Kassari Bay, west Estonian archipelago, the Baltic Sea. pp. 121-129. Gdynia, Poland: Baltic Coastal Fisheries Resource Management. Tuvikene, R., Truus, K., Robal, M., Pehk, T., Kailas, T., Vaher, M. & Paalme, T. (2009). Structure and thermal stability of pyruvated carrageenans from the red alga Coccotylus truncatus. Carbohydrate Research 344: 788-794.